At the beginning of any product development journey, product managers must plan, strategize, and prioritize how to get from idea to finished product. 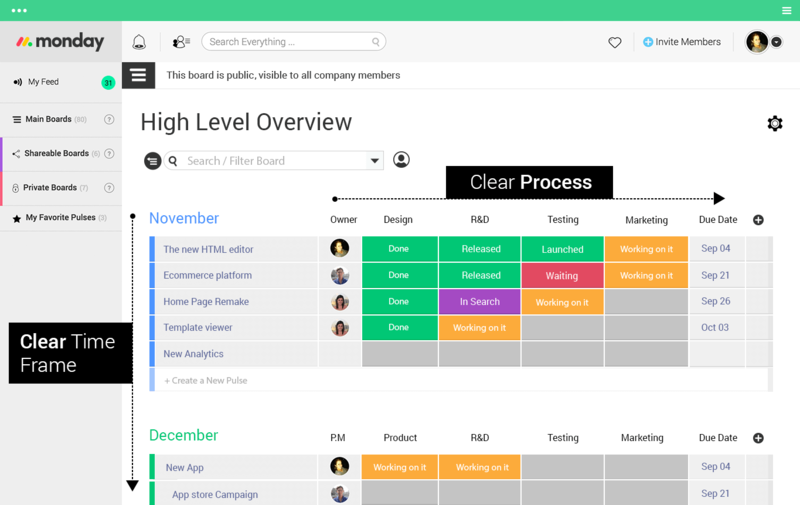 Product roadmap tools allow managers to visually represent their timeline, goals, and other business initiatives. There are many ways to create a product roadmap, including many software roadmap tools to sift through, so it’s important to keep several things in mind while deciding the best way to build your product’s roadmap. Product roadmap tools help your team stay focused and on track during a product cycle. Before you start your roadmap, know why your product is important and how it fits into your overall business strategy. The best roadmaps start with the product manager asking focused questions about the product. Finding the “why” allows managers to focus in on what is most important to include on the roadmap. Ask: Why is this product important? Why prioritize these features? Keep your answers at the forefront of all your planning and think about how your “why” contributes to the company’s overall goals. Knowing your reasoning allows you to stay focused and hone your roadmap so that it is valuable to all stakeholders. A successful roadmap will visually represent your product’s vision and how it fits into your company’s business goals. 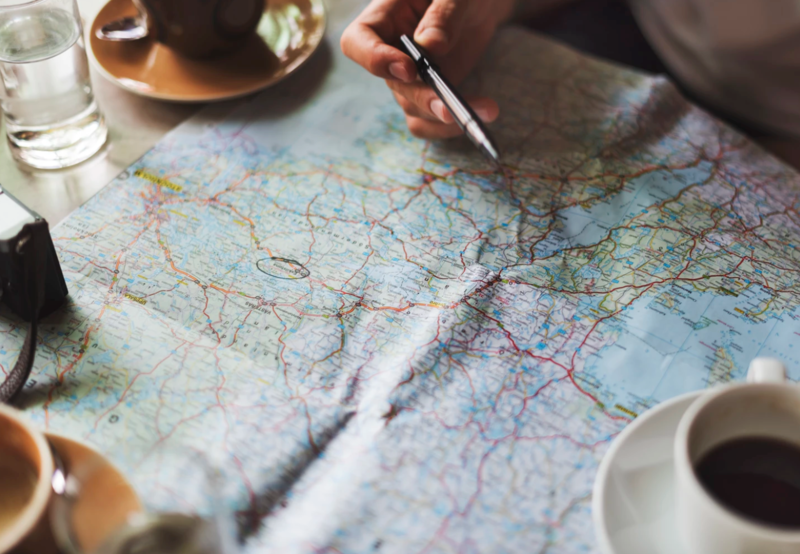 While it is possible for product managers to create roadmaps using makeshift roadmap applications like spreadsheet or presentation tools, these are static and often clunky to use. 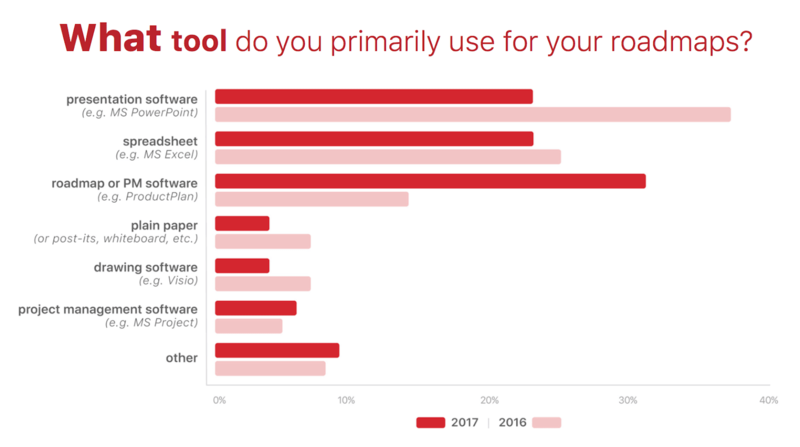 As you can see from the chart above, each year, more product managers are moving away from these static tools to software that lets you work smarter not harder. Purpose-built product roadmap software makes it so easy to quickly create visually appealing, dynamic roadmaps. Roadmaps need to be flexible: company priorities shift, resources change, and schedules get moved around. Purpose-built roadmap software is typically cloud-based and anyone with access will automatically get the newest version, thus avoiding complications with updated versions that you could get with static makeshift roadmap tools. When things change, you want your team to be prepared and stay on track. There is no reason to not find a purpose-built roadmap tool, as there are many free product roadmap tools available and sites to research the best roadmap software. Many of the companies offer SaaS pricing models, free trials, or even free templates or tools to smaller companies. You can take the time now to choose the right tool for your team, before committing. Make sure to pick one that allows for collaboration, is cloud-based, and visually appealing. Many of the roadmap tools allow you to drill down into more detailed formats, or simply click a button to “hide” the details for a higher-level look. Product managers create product roadmaps to share with various audiences: executives, sales, marketing, and developers, to name a few. Because of this, it is important to pick roadmap software that allows you to show different views with varying levels of details depending on your audience. 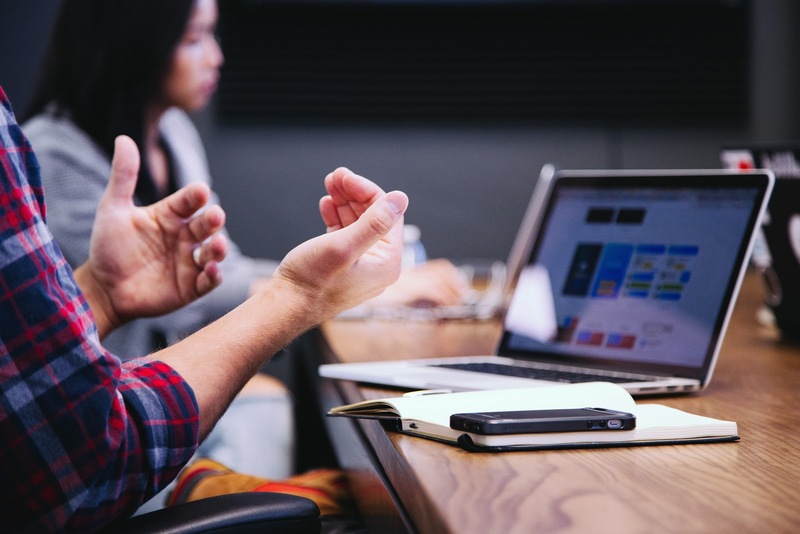 If you are talking with developers, then you need to show a more detailed level with actionable items, compared to your executives, who are more interested in learning the higher level of what actions will take place to meet your company’s business goals. Not only do you need to think about what levels of detail your audience is interested in, but think about your audience’s business functions. In choosing your product roadmap, you need to consider what template to use. Marketing roadmaps, which match marketing activities with overall business strategies, will look different from a features roadmap, which details product features are coming and when. The purpose of a roadmap is to make it easy to communicate your product strategy across your company. It is where you plan, share, track, and update your product initiatives. After you have built your roadmap, bearing in mind that it is a dynamic document, it’s important to already have a plan for how you are going to use it as a communication tool. Roadmaps are excellent for presenting to stakeholders, or collaborating across teams. Because roadmaps are so visual, they also integrate very well with CloudApp’s visual communication tools. CloudApp's screen recording software allows anyone to quickly communicate with coworkers about your product roadmap. For example, you could do a screen capture of part of the roadmap for a teammate. You can add annotations to screenshots to highlight what your coworker needs to work on or focus on for the next part of the project. Once have visually communicated your thoughts, your content is uploaded to the cloud via a secure short link that you can then quickly send and share directly in Slack or email. If there is part of the roadmap that requires more explanation than you can fit with just text, you can record a video tutorial, a how-to GIF, or a webcam screen recording where you visually show your colleagues what a certain part requires. This saves time and confusion, especially since roadmaps don’t necessarily have a lot of space for detailed text. Roadmaps must be strategic documents show the plan for your product, to keep your team on track to execute that plan. Roadmaps need to be visual and dynamic, and most all, you must use them to keep communication flowing so nothing clogs up your product’s journey. 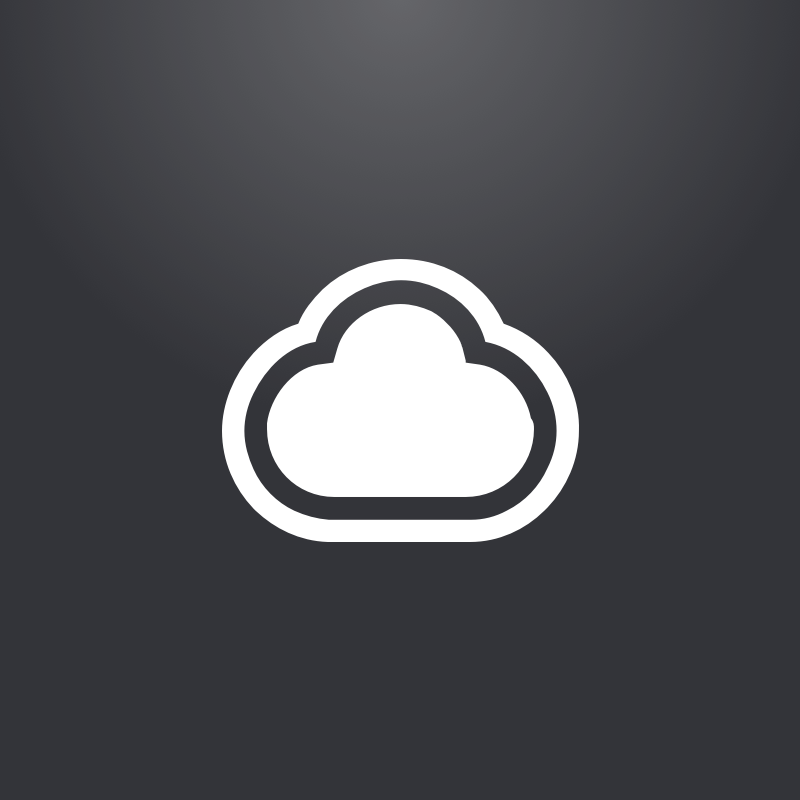 Learn more about how CloudApp for product development here.